It is now recognized that the breast exhibits a circadian rhythm which reflects its physiology. There is increasing evidence that rhythms associated with malignant cells proliferation are largely non-circadian and that a circadian to ultradian shift may be a general correlation to neoplasia. Cancer development appears to generate its own thermal signatures and the complexity of these signatures may be a reflection of its degree of development. that seems to be sensitive for the early detection of breast cancer. This article focuses on dynamic thermal analysis as an evolving method in breast cancer detection in pre-menopausal women with dense breast tissue. Prospective multi-center trials are required to validate this promising modality in screening. 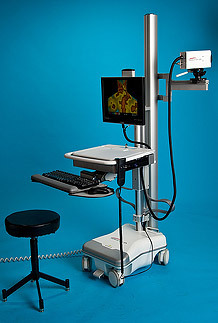 The issue of false positives require further investigation using molecular genetic markers of malignancy and novel techniques such as mammary ductoscopy. Rassiwala M1, Mathur P2, Mathur R3, Farid K3, Shukla S3, Gupta PK4, Jain B4. Early screening plays a pivotal role in management of breast cancer. Given the socio-economic situation in India, there is a strong felt need for a screening tool which reaches the masses rather than waiting for the masses to reach tertiary centers to be screened. Digital infra-red thermal imaging (DITI) or breast thermography as a screening test offers this possibility and needs to be carefully assessed in Indian scenario. The study involved 1008 female patients of age 20-60 years that had not been diagnosed of cancer of breast earlier. All the subjects in this population were screened for both the breasts using DITI. Based on the measured temperature gradients (ΔT) in thermograms, the subjects were classified in one of the three groups, normal (ΔT ≤ 2.5), abnormal (ΔT > 2.5, <3) and potentially having breast cancer (ΔT ≥ 3). All those having (ΔT > 2.5) underwent triple assessment that consisted of clinical examination, radiological and histopathological examination. Those with normal thermograms were subjected to only clinical examination. Forty nine female breasts had thermograms with temperature gradients exceeding 2.5 and were subjected to triple assessment. Forty one of these which had ΔT ≥ 3 were proven to be having cancer of breast and were offered suitable treatment. Eight thermograms had temperature gradients exceeding 2.5 but less than 3. Most of these were lactating mothers or had fibrocystic breast diseases. As a screening modality, DITI showed sensitivity of 97.6%, specificity of 99.17%, positive predictive value 83.67% and negative predictive value 99.89%. Based on the results of this study involving 1008 subjects for screening of breast cancer, thermography turns out to be a very useful tool for screening. Because it is non-contact, pain-free, radiation free and comparatively portable it can be used in as a proactive technique for detection of breast carcinoma. Effectiveness of a non-invasive digital infrared thermal imaging system in the detection of breast cancer. Department of Surgery, New York Presbyterian Hospital-Cornell, New York, NY, USA. Digital infrared thermal imaging (DITI) has resurfaced in this era of modernized computer technology. Its role in the detection of breast cancer is evaluated. In this prospective clinical trial, 92 patients for whom a breast biopsy was recommended based on prior mammogram or ultrasound underwent DITI. Three scores were generated: an overall risk score in the screening mode, a clinical score based on patient information, and a third assessment by artificial neural network. Sixty of 94 biopsies were malignant and 34 were benign. DITI identified 58 of 60 malignancies, with 97% sensitivity, 44% specificity, and 82% negative predictive value depending on the mode used. Compared to an overall risk score of 0, a score of 3 or greater was significantly more likely to be associated with malignancy (30% vs 90%, P < .03). DITI is a valuable adjunct to mammography and ultrasound, especially in women with dense breast parenchyma. Thermal detection of embedded tumors using infrared imaging. Department of Mechanical Engineering, Virginia Tech, Blacksburg, VA 24060, USA. Breast cancer is the most common cancer among women. Thermography, also known as thermal imaging or infrared imaging, is a procedure to determine if an abnormality is present in the breast tissue temperature distribution. This abnormality in temperature distribution might indicate the presence of an embedded tumor. Although thermography is currently used to indicate the presence of an abnormality, there are no standard procedures to interpret these and determine the location of an embedded tumor. This research is a first step towards this direction. It explores the relationship between the characteristics (location and power) of an embedded heat source and the resulting temperature distribution on the surface. Experiments were conducted using a resistance heater that was embedded in agar in order to simulate the heat produced by a tumor in the biological tissue. The resulting temperature distribution on the surface was imaged using an infrared camera. In order to estimate the location and heat generation rate of the source from these temperature distributions, a genetic algorithm was used as the estimation method. The genetic algorithm utilizes a finite difference scheme for the direct solution of the Pennes bioheat equation. It was determined that a genetic algorithm based approach is well suited for the estimation problem since both the depth and the heat generation rate of the heat source were accurately predicted.